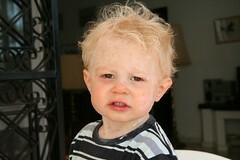 Joel had chicken pox while we were away. This attractive picture is the result of a combination of much scratching of the back of the head, calamine lotion and a spot right in the bottom lid of his right eye. He had 2 bad nights of itchiness that we knew about, and other than that, was pretty much OK.
Oh, and we probably gave it to everyone on the plane on the way over. Sorry about that!